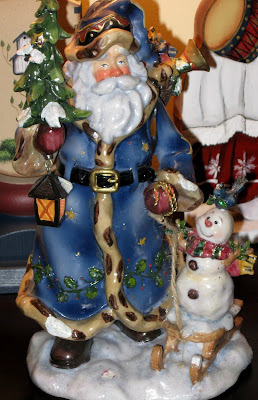 This ceramic Santa is 8" tall. The colors are really vivid. He has a big bag on his back full of toys. I'm not usually into bright colors, but they sure look great on him! Cute Santa with the snowman - has great personality! Ok, now I can look at your Santa stuff! It was too early for me before but now It's December, whoopeeee! I love Christmas, can't wait. Your Santa would look great in my bay window. BTW, I cried myself laughing at your comment on my blog, priceless! Mmmmmmm love this one - Santa's little helper is so sweet ! Is it cooooooold up there in Canada ? We are at about zero this morning....brrrrrrrrr ! Oh Lori, I love this one! He is just really really cool! Happy Friday!